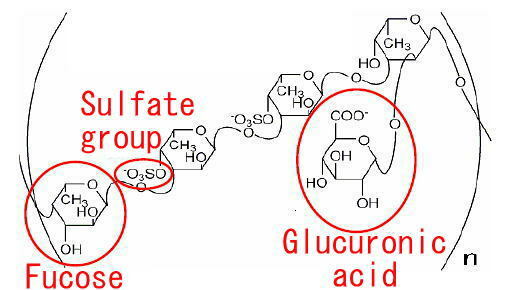 Fucoidan is a polysaccharide in which sulfate group and uronic acid are bonded with "fucose" as a main constituent sugar. "Fucose" is deeply involved in demonstrating the health power of fucoidan. Fucoidan is contained in many sticky substances of brown algae such as Mozuku, kelp and brown seaweed. Chemically, fucoidan is a polysaccharide in which sulfate group and uronic acid are bonded with fucose as the main constituent saccharide. The commonly used name "fucoidan" is not a substance attached to substances of the same structure, but it is a generic term for polysaccharides whose main component is fucose. A galactose, a mannose, xylose and Glucuronic acid exist besides fucose. It's different in composition saccharide and structural formula depending on the kinds of brown algae. "Fucoidan amount" of fucoidan product is displayed on each manufacturer's website. It is a point to check whether it is the content of "fucose" as the main ingredient of fucoidan, or whether it is content other than fucose. Also, the number displayed may not be the content but it may be the compounding amount.Normally, when it is commercialized, the amount of ingredients will decrease, but there are many sellers who do not announce the content after commercialization. Let's check the content of fucose by showing the results of the analysis test.